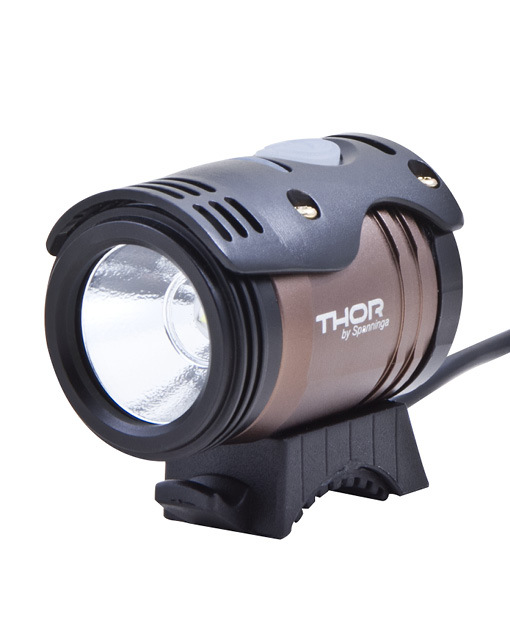 New for 2018, the Thor 800 headlight is ideal for riding singletrack at night. It has a nice big round beam. I saw these at Eurobike in summer, 2017 and ordered a bunch. We now have these in stock. Thor from Spanninga is blazingly bright at 1100 lumens. The beam is a large round floodlight with an extremely bright center spot. It's great for riding singletrack as you can easily see the trail ahead at a distance while descending at speed. 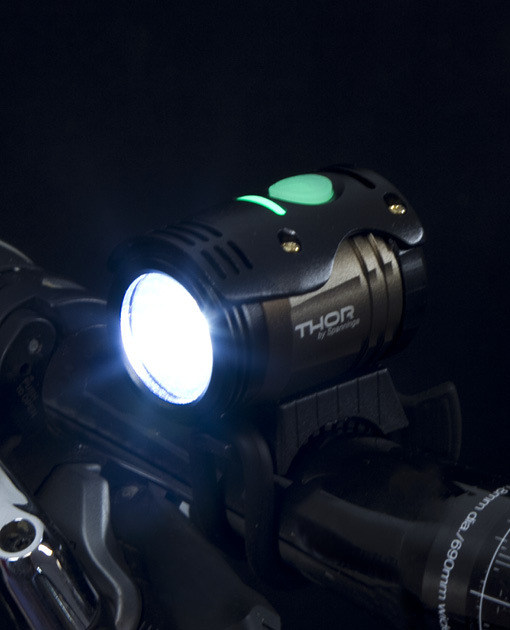 The Thor can be mounted directly on the handlebar, or on your helmet, as well as directly on your head with a head strap. Aim the beam straight ahead to see well at a distance, and close up, as well as all those low branches. Definitely not recommended for riding on roads in traffic as oncoming car drivers will pull out their shotguns! High and Low power settings. Low provides plenty of light 90% of the time. Only a few years ago, the brightest lights weren't as bright as the Thor on low power. Mounted on the included helmet mount. 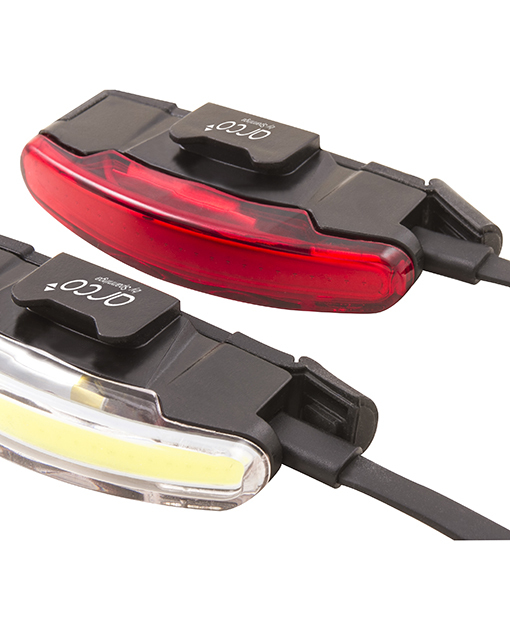 The Arco Set, front and rear "be seen by others" lights, are extremely bright. 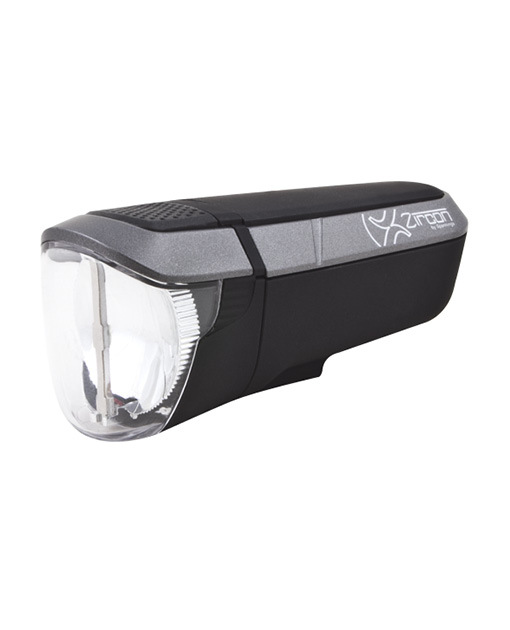 While the front light isn't bright enough for the cyclist to see the road at high speeds, it's probably too bright to be used at night in traffic since car drivers will likely become ANNOYED. But in the daytime, it's amazing. The taillight is almost blinding at night. And in the daytime, it's ideal whether you're in heavy traffic or a back country road. There are two brightness levels in steady mode, and flashing mode is at the brighter setting. The Arco lights charge via USB. If you use them at night, I think the taillight should be used at the lower power setting. Here's the Arco front light on the fork of my Rambouillet. It attaches easily with a rubber "O" ring. So if you leave your bike locked in a public area you'll want to remove it, but that only takes a few seconds. The surface of the Arco against the fork blade is rubber, so the Arco stays put while riding. It could also be mounted on the handlebar or the head tube of the frame on many bikes. I now have three lights on the rear of my Rambouillet. Upper left is the Secula Plus dynamo powered taillight. 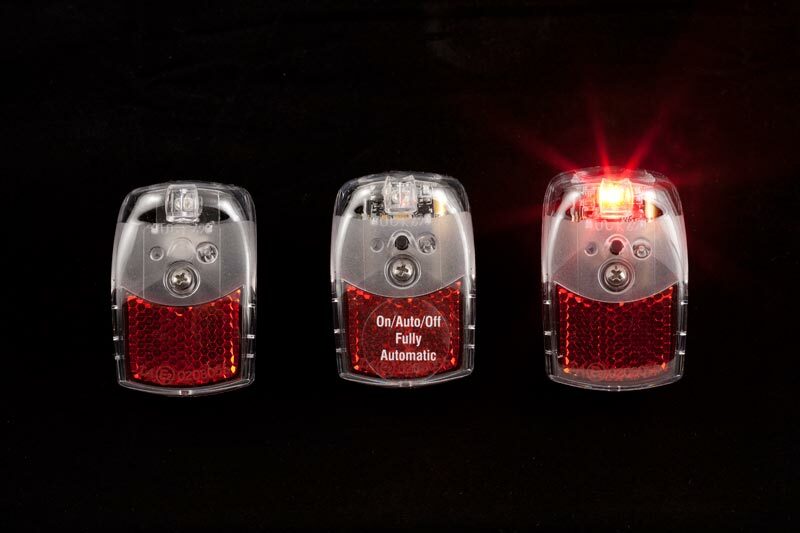 On the right is the Secula Permanent battery powered taillight. 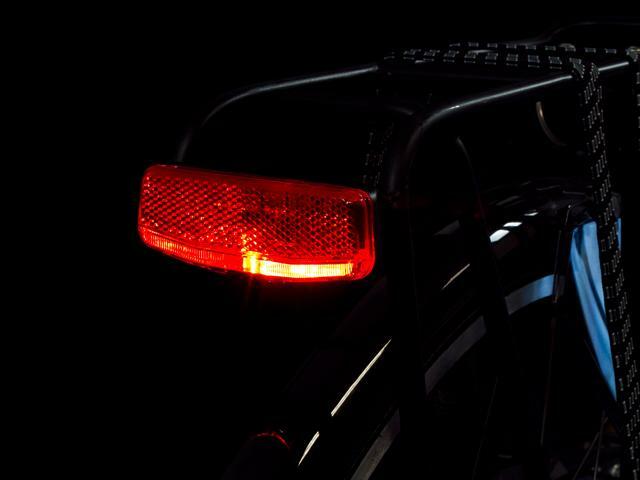 And now, below the Secula Plus, is the Arco rear taillight. It's significantly brighter than the Secula taillights, and brighter than I need at night. But for daytime use, it's fabulous in flashing mode. Don't use flashing lights at night please! And yes, that's snow on the deck. The winter riding season has begun. Yippee! Included with the Arco Set is one charging cable which plugs into a Micro USB port in one end, opposite the power button. 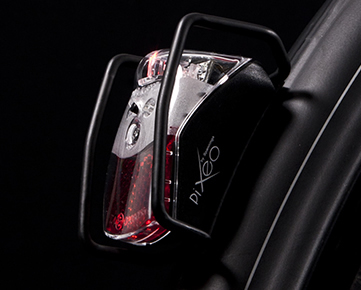 The Spanninga Pixeo LED taillight mounts on a rear fender. There are four versions. On the left is the Pixeo Xs. 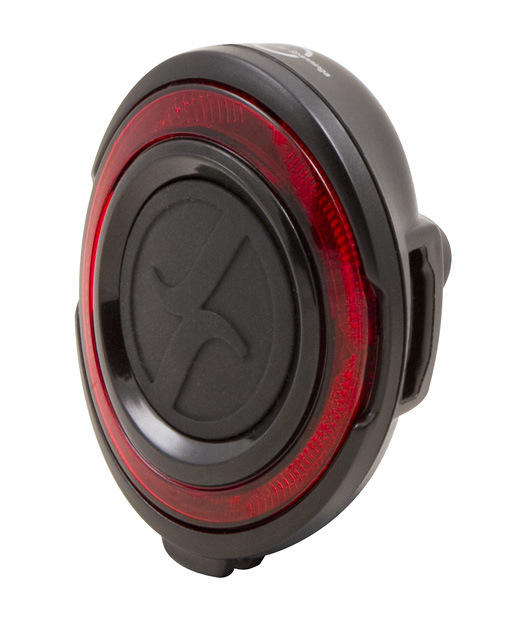 The Xs is powered by any 6 volt bicycle dynamo, such as the Schmidt SON, Sanyo H27, or Busch & Müller Dymotec 6. It has a standlight which keeps the light on for a few minutes after you stop. It's available with either a black base or a chrome finish base. If you have shiny stainless steel fenders like Gilles Berthoud, the chrome finish base will look better. In the middle is the Pixeo Xba. It is powered by 2 AAA batteries (included) and has a 100 hour run time.The Xba has a three position switch; On/Auto/Off. The Auto setting will switch the taillight on or off as needed. The Xba has both a motion sensor and a light sensor. 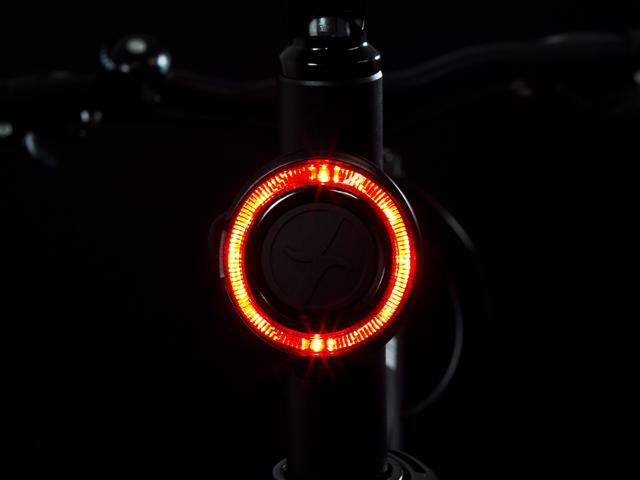 If the bike is moving and it's dark out, the light will automatically come on. When you stop, the Xba will remain on for 4.5 minutes and then switch off automatically. The Pixeo Xb is on the right. It's the one I switched on for the photo. It has a simple two position On/Off switch.The Pixeos are visible over 180 degrees horizontal, and are very bright directly on axis, due to focusing prisms in front of the super bright LED. These taillights do not blink. 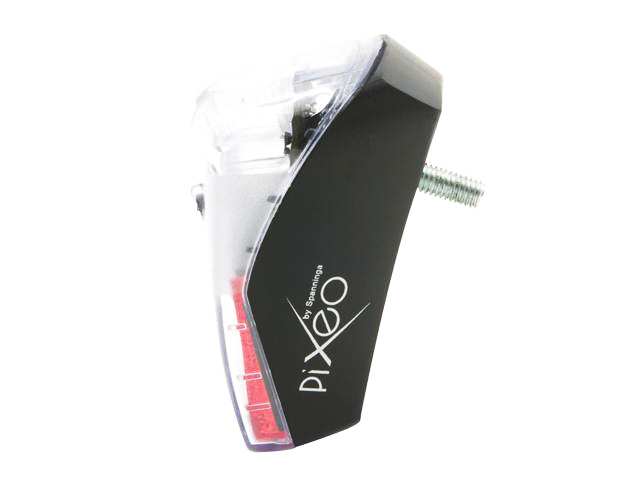 The Pixeo Protector is made of steel and should protect your Pixeo from most bumps. We now stock the Pixeo Xb with chrome base and chrome protector. 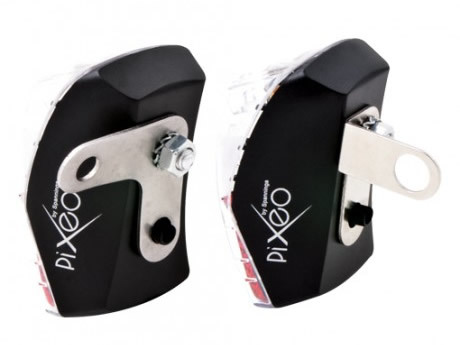 We have a set of two stainless steel mounts that enable using any of the Pixeo or Vena models mounted to a rear cantilever stud, or to many seatpost binder bolts. 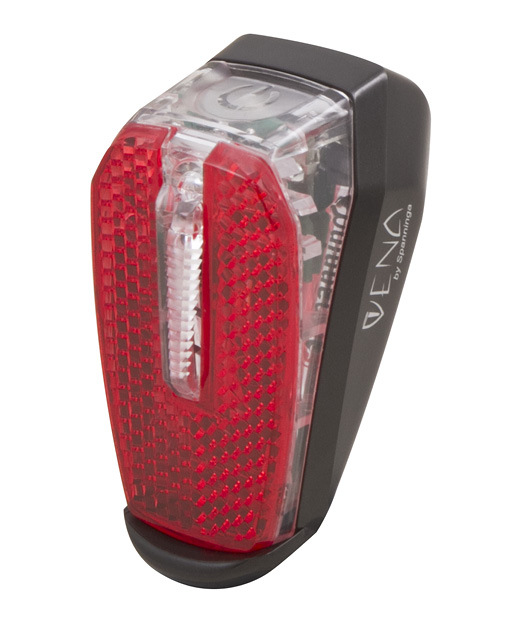 New for 2016, the Vena fender mounted taillight takes two AAA batteries with a 75 hour run time. A bit more expensive than the Pixeo Xb, but brighter. AAA batteries included. Manual On/Off switch. The Solo taillight is battery powered. The light from a single LED in the bottom center spreads out across the width of the light via a series of mirrors. The upper red section is standard reflector. The bottom clear section is illuminated by the LED. 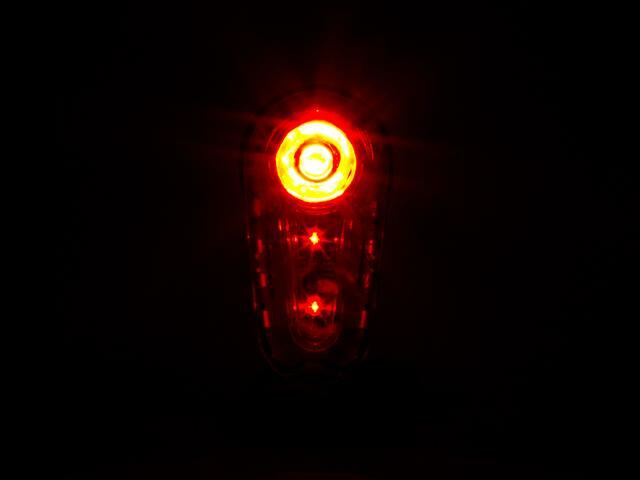 Here, viewed slightly from the side, we see the light towards the right side of the taillight. From straight behind, the light is illuminated all across the taillight. 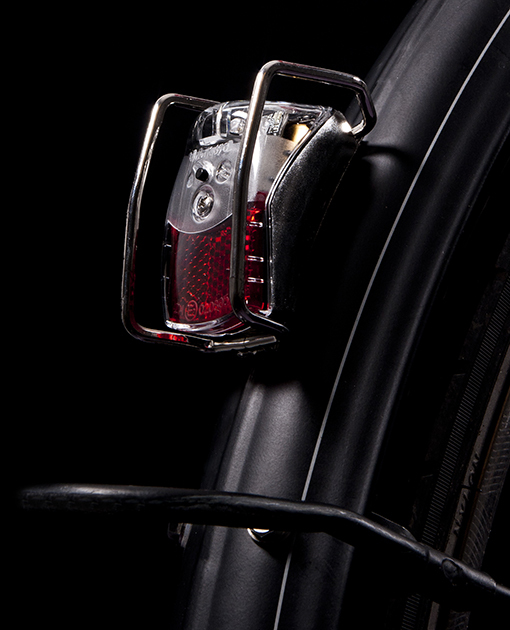 The light can be mounted at either 50mm or 80mm, depending on your rear rack. This is the forward face of the dynamo version. The battery version is a bit different, but offers the same mounting options. 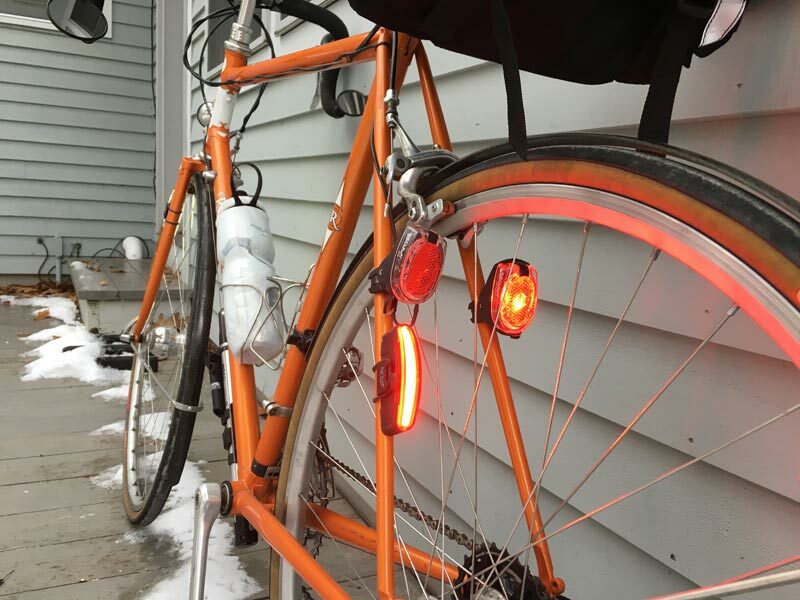 This wonderful new taillight straps to the seatpost. It has two very bright LEDs, one at the top and one at the bottom. Light from the LEDs is spread evenly around the red circle, about 2" in diameter. Attaches and detaches in seconds from your seatpost. Powered by 2 AAA batteries. Steady on mode lasts about 50 hours, flashing mode lasts about 100 hours. 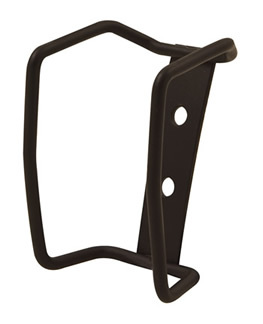 The O-Guard is like the O, but it mounts to your rear fender. Powered by 2 AAA batteries. Run Time: 50 hours. The Ruby 3 has an extremely bright .5 watt LED plus two extra LEDs below for great illumination for drivers approaching from the rear. It also provides excellent side visibility, about 220 degrees. 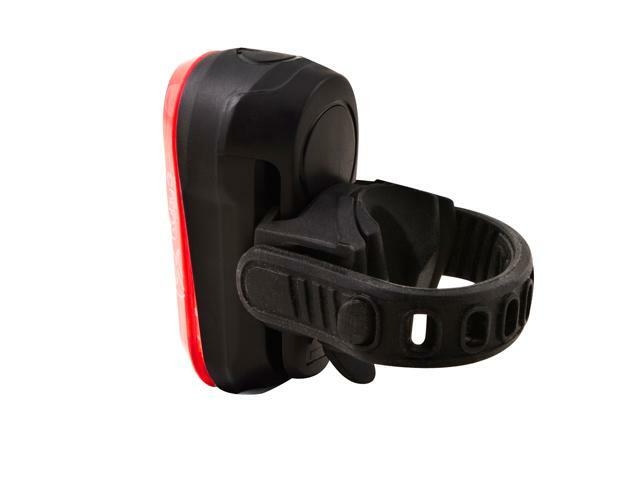 It straps easily onto your seatpost with the supplied rubber strap. Slide the light off the rubber strap mount and it clips directly to your belt. Don't look straight at this taillight at arm's length, it's painfully bright. 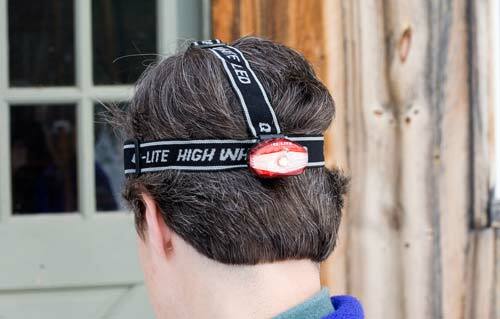 At full power, the run time is about 50 hours when on steady, and 150 hours flashing. There's also a low power steady mode with a 90 hour run time. 2-AAA batteries. 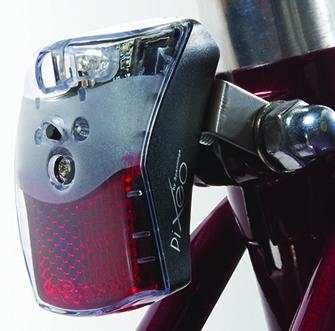 The Zircon headlight mounts to your handlebar. At 25 lux it is bright enough for commuting in most conditions. 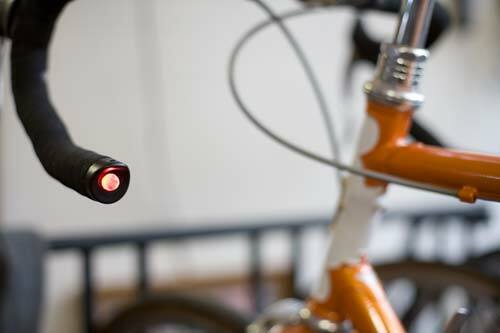 The beam shape won't blind oncoming cyclists on the bike path. Powered by 4 AA batteries. It also has a 40 Lux flashing mode which is great for daytime use. The Luceo mounts to the fork crown on bikes using V brakes or disc brakes. The mount is built into the light itself, so using this light at the fork crown with either caliper brakes or center pull cantilevers is impossible. But with either V brakes or disc brakes, this is one fine inexpensive headlight for the moderate speed commuter on relatively flat roads. 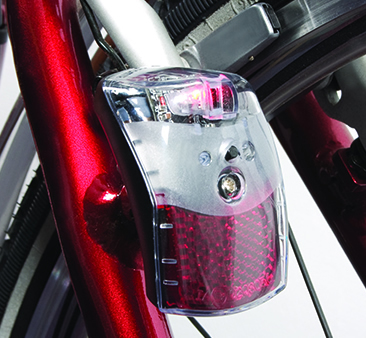 The Luceo uses a center mounted LED pointing back towards the reflector. The reflector makes excellent use of the LED's output providing a moderate width horizontal rectangle of light (on a vertical surface) and dimmer light above and below the bright central rectangle. On the road, where it matters, the Luceo's beam is rather tall, close to the light patch of the Schmidt E6, but without that light's intensely bright top section, and much more diffused. I don't recommend the Luceo for fast descending on mountain roads. I do recommend it for cruising up to 15 mph on dark country roads, as well as urban commuting. 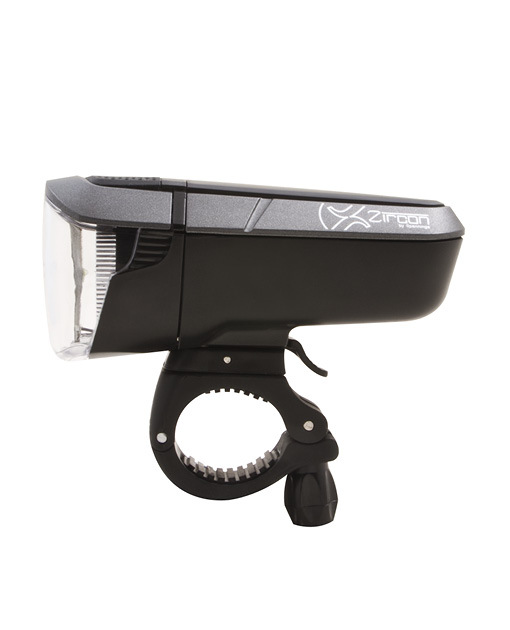 This headlight really shouldn't be compared with the Ixon, Ixon IQ or Lumotec IQ Fly from B&M, both or which have brighter and larger beams and are more expensive. 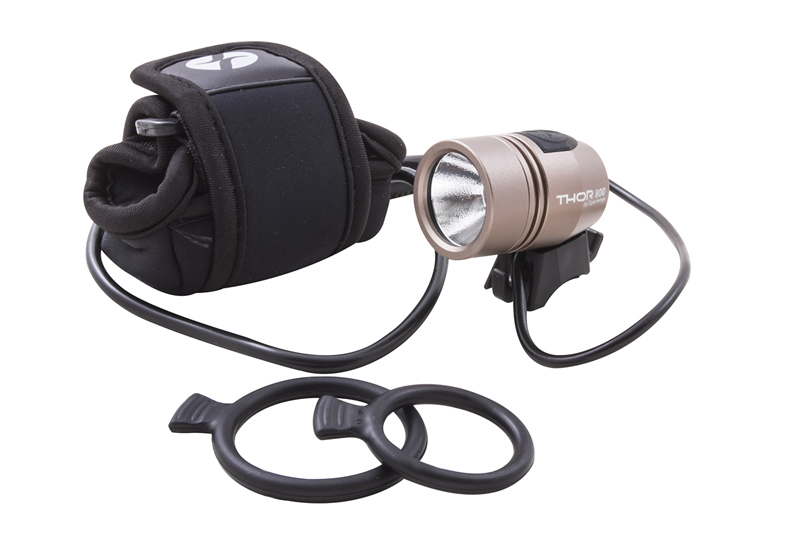 The Luceo should be compared with lights such as the Cateye EL530 and the Busch & Müller Lumotec with halogen bulb. So here goes. The EL530 has a cute little spot surrounded by a dimmer halo. It's the classic symmetrical beam that most light makers sell you. The central spot of the Cateye is slightly brighter than the central rectangle of the Luceo. But that central rectangle is about four times wider than the diameter of the EL530's central spot, and twice as tall! When you factor in the halo around the Luceo's beam, it's much taller and wider than the Cateye EL530. Compared with the Lumotec, the Luceo's beam is not as wide. It's about 3/4 the width of the Lumotec. But the beam is quite a bit taller than the Lumotec. As you're moving along, you'll have more time to see something on the road surface with the Luceo. Of course the Luceo is more expensive than the Lumotec. And the Luceo XS is available for 6 volt 3 watt dynamos. Just remember that the Luceo only mounts at the fork crown, and only with V brakes or disc brakes. If you have traditional cantilever brakes, there's simply no way to mount this light at the fork crown. Spanninga makes a nice headlight using 5 LEDs, the Q229. It has three settings. First setting has three LEDs lit. Second setting has all five LEDs lit. And the third setting has all five LEDs flashing. The Q229 is great for fixing a flat or dealing with other mechanical issues. 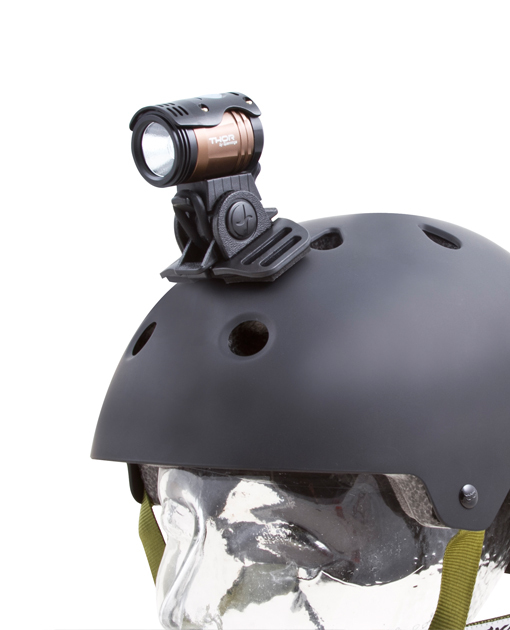 It can also be zip tied to your helmet making a great helmet mounted light for reading road signs or a map. 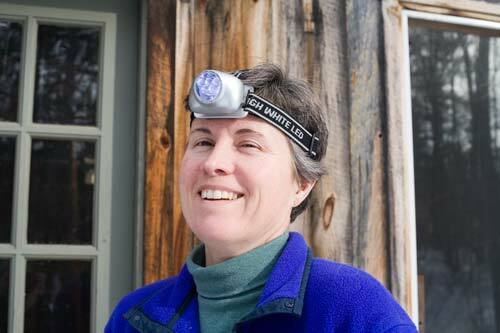 It's also great for carrying wood in from the shed, or any chore that requires light while keeping your hands free. The vertical angle is adjustable in several click stops on the mount. You'll need a small phillips screw driver to install the A AA batteries, which are included. It takes a few minutes to install the batteries. 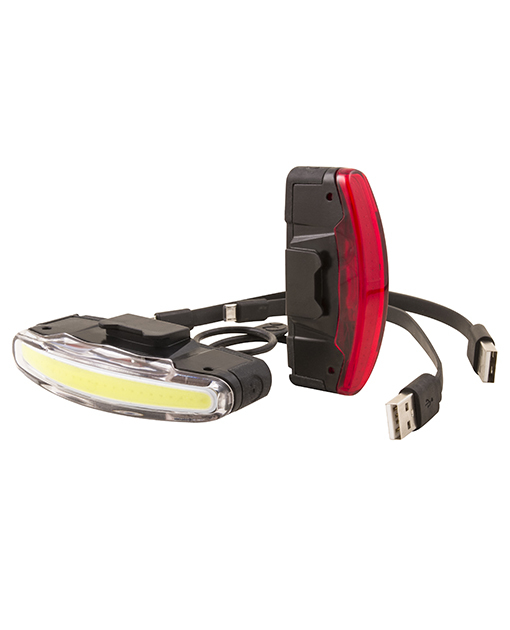 Q229 Headlight $ 51.00 Batteries Included. 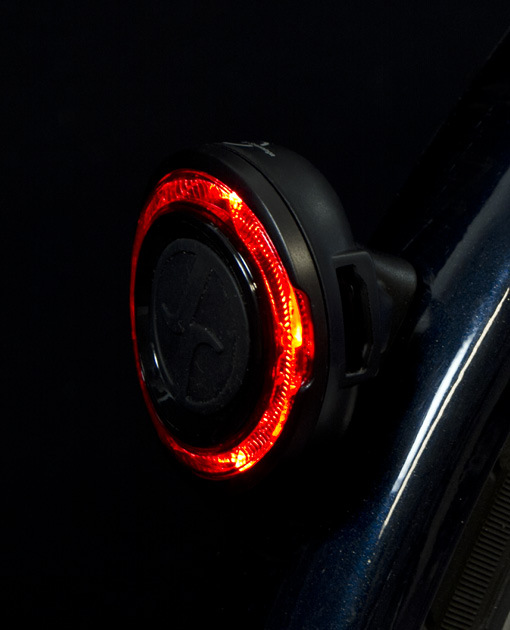 The Star Cute can be slid onto the rear of the Q229 headlight band. 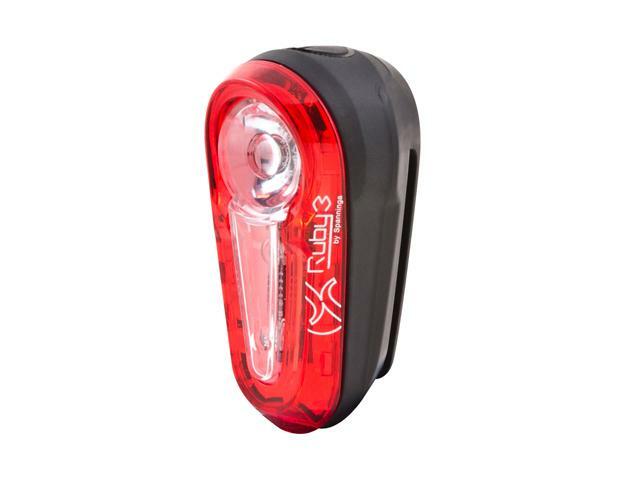 It has a bright red LED that can be set to steady or flashing modes. Just press the little button the back. Star Cute $ 20.00 Battery Included. 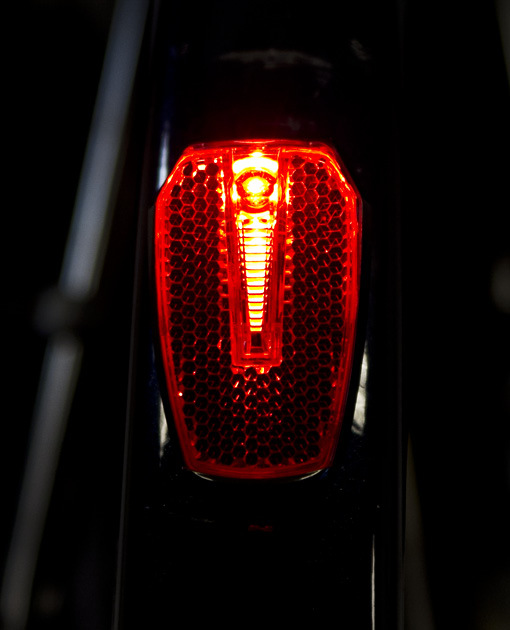 The QL219 road handlebar end plug lights do just that! 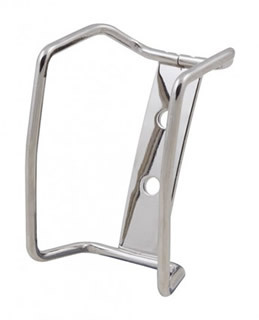 We have them for road handlebars as well as for flat or MTB bars. The road version has a single large LED in each plug. 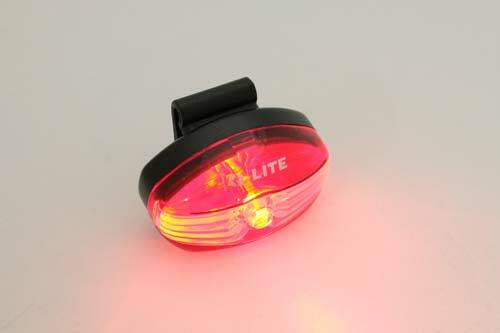 The MTB version has two smaller LEDs in each plug. The batteries are LR44 and each plug takes two batteries. Batteries are included. These are sold only in pairs. The prices are for two plugs, in other words, one pair of plugs. 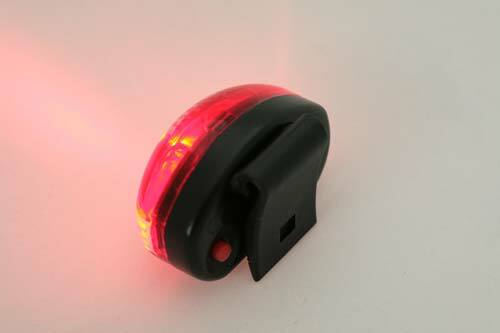 This small taillight attaches to the seat post or seat stay without tools, and just a coin is needed to change the two AAA batteries. 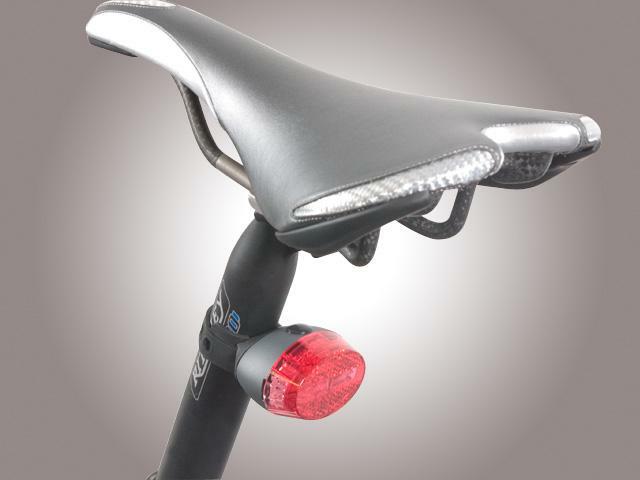 The light pivots vertically on its mount, so adjusting the aiming of the light is easy, whether it's on the seat post or a seat stay. Power your HL 2000 from a hub dynamo! 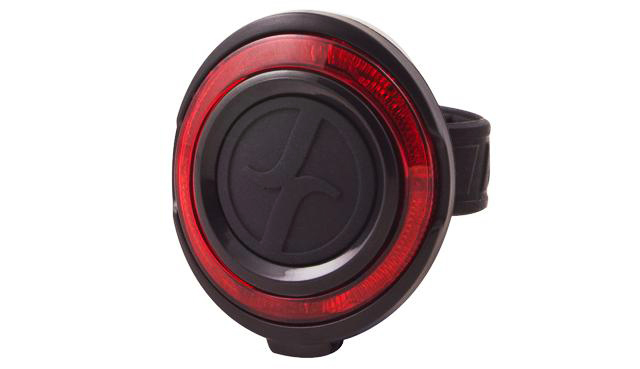 We have a few optional mounts for the Hella HL 2000 headlight. And they do a very interesting thing. They have wiring for a hub dynamo, allowing you to power the HL 2000 from the hub. There are three types. 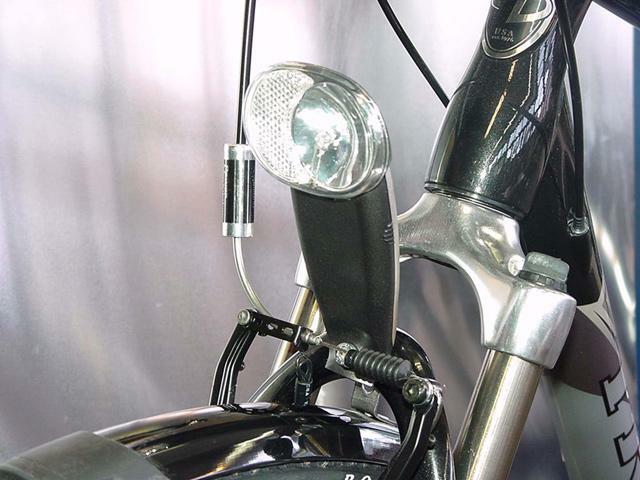 One replaces the standard handlebar mount with another handlebar mount having the electrical connections and the wiring. The handlebar mount will not fit the new goofy oversized handlebars. Sorry. The next allows mounting the HL 2000 at the fork crown on a fork with V-brakes or disc brakes. The last mounts the light at a fork crown with cantilever brakes, or, again, disc brakes. There is no option for mounting the HL 2000 on a fork which has caliper brakes. Click here for a list of shops selling Busch & Müller, Schmidt, Pitlock, Spanninga and Supernova. 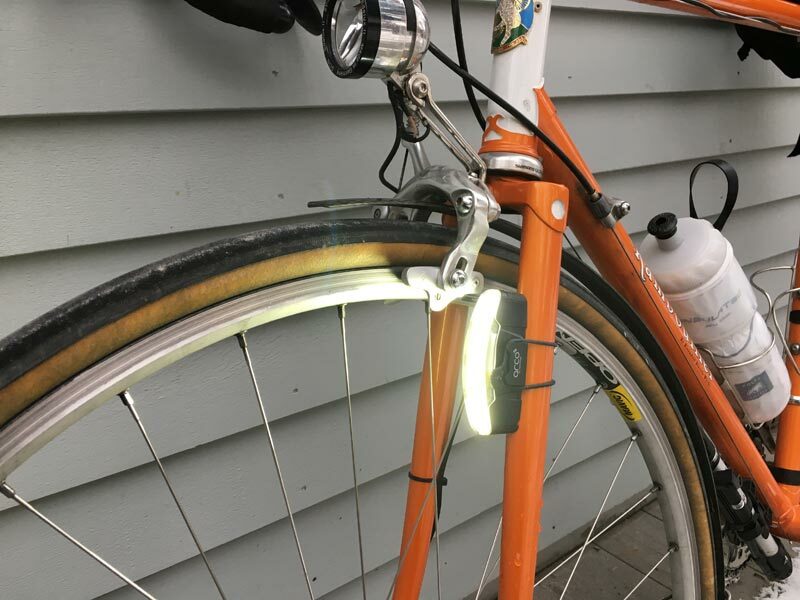 If you have a retail bicycle shop, or are a bicycle manufacturer, you can purchase Spanninga and Hella lights, at wholesale pricing for resale. Any shop in the US or Canada can purchase Spanninga lights for sale in your store. Please call me for pricing. Peter White Cycles is the official representative for Spanninga in the US and Canada, and we want all bicycle shops to be able to sell these fine lights. In addition to Spanninga, we represent Wilfried Schmidt Maschinenbau, Busch & Müller, Specialites TA, Pitlock, and Tout Terrain. We can provide your shop with all of these products at wholesale pricing. See this page for more details on opening a wholesale account with us.